For the 2019 NASFAA National Conference, registered attendees have three options for pre-conference sessions. These informative sessions are included with the registration fees at no additional cost. While availability is on a first-come, first-served basis, and space may be limited, NASFAA encourages you to indicate your preference on the related question within the registration process so we can best accommodate attendee interest. If you've already registered, you can edit your registration to indicate your preference until April 26, 2019. 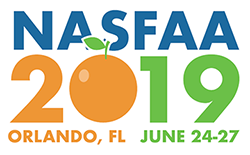 NASFAA U will offer two in-person courses during the 2019 National Conference: Satisfactory Academic Progress and Administrative Capability. Those who attend one of the two pre-conference NASFAA U sessions will receive a test voucher at the end of the training session. Attendance is a requirement for exam access. This course provides an overview of satisfactory academic progress (SAP) concepts and guides the learner through evaluating SAP, appeals, and additional policy considerations. Quick quizzes, learning activities, and reflection questions help reinforce content and help individuals understand SAP. Administrative capability is at the heart of the Title IV regulations, encompassing many of the measures of an institution’s Title IV eligibility. Demonstrating administrative capability to participate in the Title IV programs involves virtually every office within an institution, making compliance a campus-wide commitment and responsibility.